Man do I love going to my dad’s side of the family Christmas Eve parties. The place is always jam packed with the most amazing food you could ever imagine. There is something about Italian families getting together to cook food for half the block, it’s quite funny actually. I mean there are 10 different appetizers, 3 different main dishes and probably 10 side dishes. And then don’t forget after you are done eating they roll out the ham and then you eat a salad, it’s insane. The hams they make are always really tender, juicy and really flavorful. I don’t think they put any glazes on their hams, but I do :-). This Holiday Ham Glaze Recipe for both oranges and pineapples are really good and really easy to make. I mean they are only 5 ingredients and go great as a baster throughout the cooking process or as a finisher right before you serve the ham. If you love ham and are looking to spice it up a bit then for sure check out 1 of these recipes, you will be amazed at home much delicious flavor this adds, not-too-mention how well they both go with ham. Merry Christmas and happy eating!! 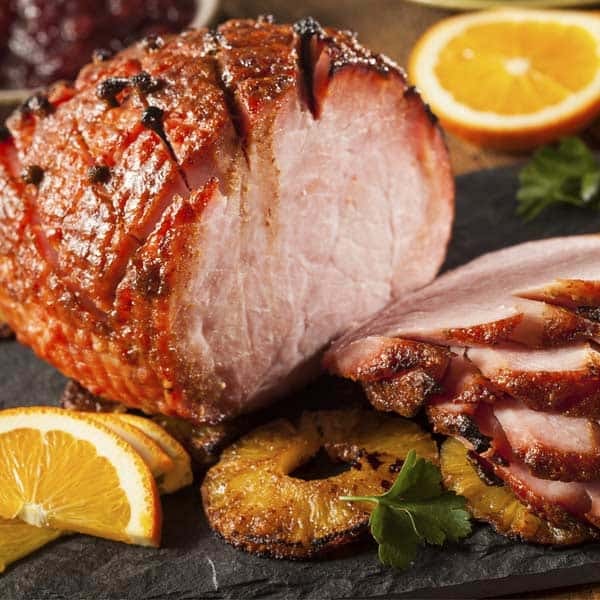 Be sure to try this Holiday Ham Glaze Recipe going two different ways! Orange: In a medium sized sauce pot on medium heat, add in orange marmalade, brown sugar, orang juice, cinnamon and cook until it is mixed and very thick (about 6 to 10 minutes). Pineapple: In a separate medium sized sauce pot on medium heat, add in butter, honey, brown sugar, pineapples and juice, and ground cloves. Cook until it is mixed and very thick (about 6 to 10 minutes).